Moscow (AFP) - Russia on Friday warned France of "serious" consequences unless Paris delivers by the end of this month a Mistral-class assault warship whose handover has been delayed by concerns over Moscow's role in the Ukraine crisis, a report said. "We are preparing for different scenarios. We are waiting until the end of the month, then we will lodge serious claims," the state news agency RIA Novosti quoted an anonymous high-ranking Moscow source as saying. 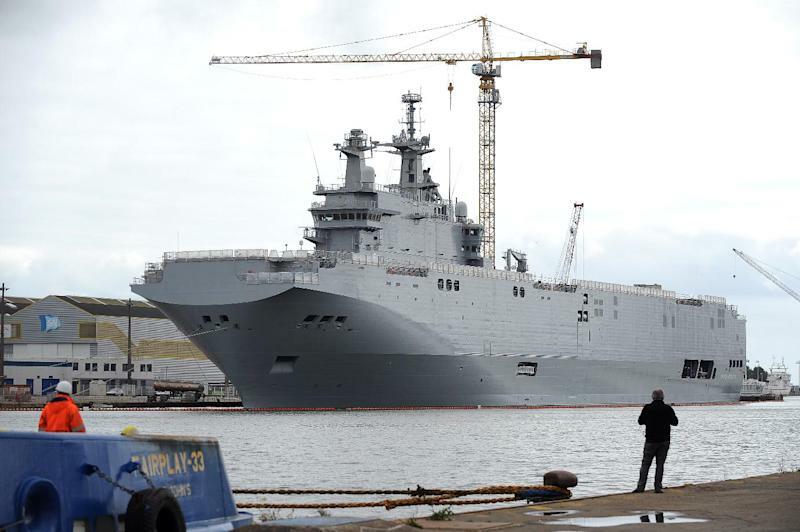 The first of two mammoth Mistral helicopter carriers was supposed to be delivered on Friday according to the original deal signed in 2011 and worth 1.2 billion euros ($1.5 billion) for both vessels. Russia's state-run arms dealer had been widely expected to attend a ceremony on Friday for the hand-over. But amid this year's Ukraine crisis and the rapid decline in the West's relations with Russia, France has come under intense pressure from its allies, particularly the United States, and in September postponed the delivery. The Moscow soure said on Friday experts were currently gauging the damage sustained by Russia and it would be made public. "This amount will not be secret," the source was quoted as saying by RIA Novosti.